Check back next week for more 'Summer Vinter' games! My name is Jo-, and I'm a creator of games! Roflgames is my personal website. I'm CEO of D-Pad Studio, a game development team most known for Owlboy. I've recently started putting my old projects on Itch.io. This one started out with a bottle of vodka (a well-known staple of my game design process). I was originally supposed to attend my bud Mattis' birthday party, but my travel plans got held up. These things happen when you're stuck on an isolated island, in the middle of nowhere. In 2014, Mattis and his Team DOS won the BAFTA for their game Size 'DOS' Matter. What else could I do but mock him for it. I decided to spend the night working on it. It took approx 6 hours to smash it together. For this one, I needed a high-octane track, right off the bat. I had been hankering to use Savant's 'Hero Of The Past' for a while (though I had imagined using it for a robot samuari fighting game). I was in a hurry, so I threw it in there. I sent the game to Mattis Sunday 7am, making my best effort to wake him up for a massive birthday hangover. A night well spent. 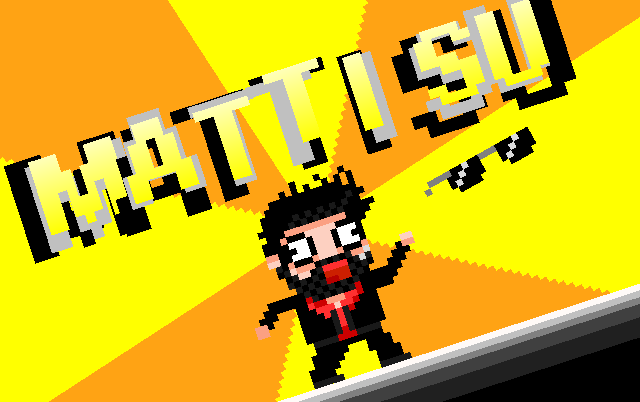 Download the game on Itch.io, or play it right here in your browser (Mattisu 1.0, HTML5). In 2009, YoYo Games (the company that took over development on GameMaker) launched several themed competitions. One of these were themed 'Environment'. I thought: "It's my time to shine", and started creating a game that'd dazzle the judges and claim me the top prize! When I start a new project, usually what I do is dive into my Vinter Vault (a collection of some 1000 songs that I nabbed from Vinter's harddrive). Most the time, I let the music do the working. I'm actually not a very creative guy, I just happen to have a very visual connection with sound. I stumbled upon the song 'Dance Like An Octopus' on Vinter's Survival Of The Fattest album. For some reason, an image of a 'radiation gnashing beaver' flashed across my mind, not an octopus. So that's what I ended up with. 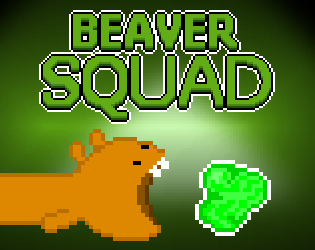 Download the game on Itch.io, or play it right here in your browser (Beaver Squad 1.0, HTML5). Phew! That took a lil while. It's been 6 years to THIS DAY that I left RoflGames and focused entierly on Owlboy. Now it's finally out, and some major stuff has happened inbetween. + Henrik (Simon's bro) joined D-Pad as chief programmer (2011). + Announced Owlboy, and missed our deadline by 5 years (2011). + Released Savant - Ascent in cooperation with Vinter (2013). + Owlboy, Owlboy, Owlboy (2013-2015). + Owlboy Launched, to massive critical acclaim! (2016). This summer is special, as it marks my first vacation since I shut down this site. LET'S CELEBRATE! 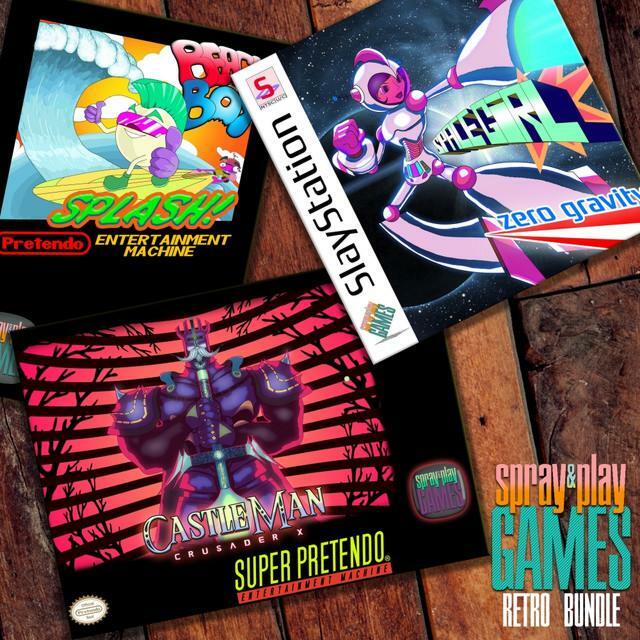 Yesterday, Vinter launched his collection of game tracks, SOME of which has been unreleased for a long time! MOST of which inspiered my RoflGames hobby projects. Each week this summer, I'm going to re-launch the games that me and Vinter started working on way back when. Let's start at the beginning! 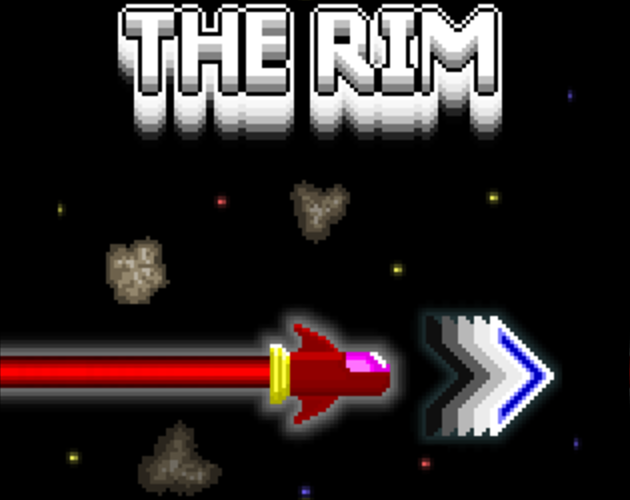 This is The Rim (launched 1st July 2009). Tomorrow I'll write a little bit about the origins of the game. These days, we're in crunch at D-Pad Studio, and I will under this period not be able to work on my personal projects here at Rolfgames. Owlboy has it's planned release this summer, so all my energy has to go down into completing it's development. During this period, I'm also keeping a rapidly updated development page for Owlboy. On this page, I'll list several new key features added to Owlboy as we're progressing. The demo should soon be out, so keep checking for it's release at DPadStudio.com. So to keep updated on our endevours, follow us at our main site, DPadStudio.com, or our facebook/twitter pages. After Owlboy's development I will return my attention to some of my rofl projects, before starting a new epic with my excellent new team! Oh damn, wouldya look at that?! Vikings plunder the prize... using trampolines! Who's that? Some freaks who just won the Nordic Indie Sensation Award, that's who!! Guess which game took the prize! Vikings On Trampolines has bounced onto many screens since we announced it. Looks like we've successfully taken the internet with our trampoline bouncing, axe wielding army! + Destructoid - Vikings on Trampolines! Vikings ON Trampolines! + 4Gamers(Dutch) - Vikings On Trampolines...Wait, what? + EGamer - Trailer of The Week, Vikings On Trampolines! Announcing D-Pad Studio's second title! We're going to Malmø(Sweden) to show our little game at the Indie Game Night! Whoever can beat either me or Simon will be rewarded an exclusive T-Shirt! Last year we showed off Owlboy at the same event, and enjoyed every second of it! We're hoping for excellent success this year aswell! Development on this title will be taken up right after the release of Owlboy. To eager awaiterers of Owlboy, I'll say this: Owlboy is, and always will be, our main priority, until it's release! Before our trip to GDC we recieved a visit from Aleksander Vinter, our righteously talented musician. What was supposed to be a week of vacation, quickly turned into a workfest! Inspiration comes easy when we start off the weekend by playing games, thereafter discussing them, whereupon we start bashing them, and start to brainstorm what woul've made them better. We sat down with more ideas than we could cope, and started on a small, innocent, spare-time project. A week of work, and we're sitting on one of the funnest games we've created yet, and we're gonna try to bring it to the Nordic Game Conference at their Indie Game Night, and I think we have a valid new submission for the Norwegian Game Awards. We're going to announce the project later on, but what i can say is that it's got an absolutly explosive 2p versus mode, platformer sections, and ofcourse, Simon's maddeningly-detailed pixel graphics. Owlboy's development might have been set back one week, but adding this new project to our roster will definetly show our players that we're here for one reason only... To create disturbingly fantastic games. 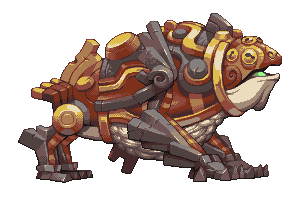 The bliss part: So much new has been added to Owlboy, both in terms of content and polish, I can barely look straight. The hellish part: My eyes are so sore from overexposure to my computerscreen, that I can barely look straight. So this week ends with an appointment at the optician's, but, the demo is hurtling along at a frantic pace. 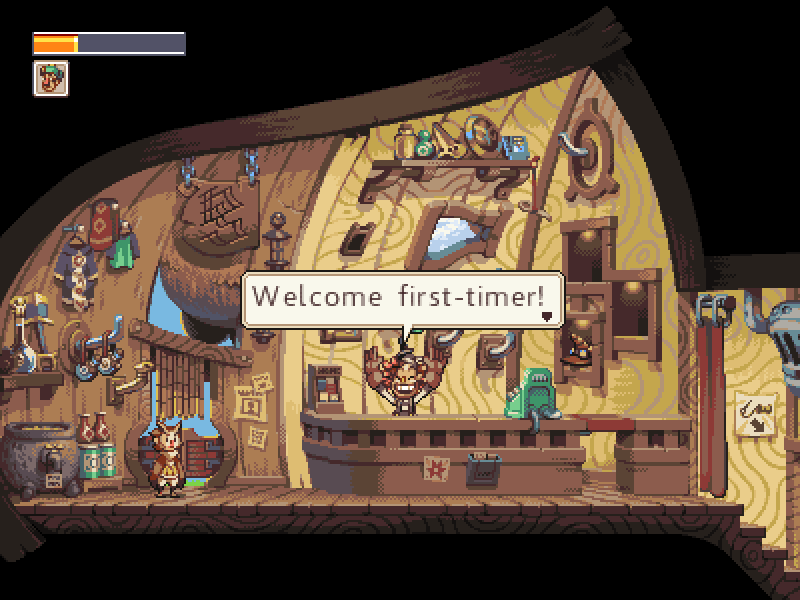 This time, we'll show off the source of Otus' powerups, trinkets and treasures: Buccanary's Shop. While adventuring in Owlboy, you'll come across rings that, by the looks of it, has been placed around deliberatly. These rings act as Buccanary's adventure ad-campaign coupons, and bringing them along to her shop will yield rewards. 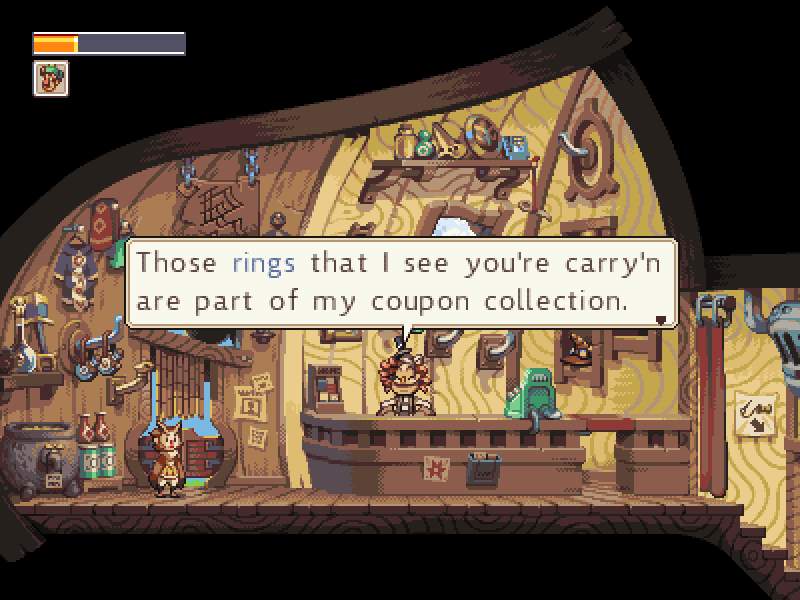 As one brings back rings to Buccanary's Shop, extra items will appear on the walls of her shop, available for Otus to bring along on his adventure. Which items will be on display you ask, you sniffling puppy? Secret ones. Now go, the weekend is upon us! Simon's pixels has been jumping off his screen all week, as he's been drawing every item, powerups and pickups into the game. He's also working on bringing the first Dungeon's boss to life for the GDC playable demo. Meanwhile, I've been adding powerup effects, menu screens and layed many a bugs to waste with my keyboard. We've added a Owlboy Development thread on TIGSource.com, be sure to check it out, as the TIGSource forum is one of the biggest communities of indie developers. If they think your stuff looks great, everyone does! Because it's the single most greatest convention in the world! That's why! Not only are we going to print up some Owlboyish T-Shirts, some amazing Owl buttons and try to bring the whole team, we're also working on getting a playable Owlboy Demo on CD finished for hand-outs! Short on GDC San Francisco: It's Hollywood for gamers! Fans gather here, developers gather here, but most importantly, my own bloodline, the Indies gather here! We're hoping to meet as many as possible, and share our gaming visions and ideas. I'm also hoping to catch a glimps of my all-time favorite big kahuna devs, like Peter Moleneux(Black & White, Fable) and Will Wright(Spore, Sims). More on the development of the Owlboy demo next time. The winning game was Kesper's Keep, by a small norwegian indieteam called Moondrop. Kesper's Keep is a platforming game, where you control a monk-like figure, who needs to manuipulate lights sources inorder to traverse through the game. Blocks dissapear/appear according to what color of lightsource hits it, which opens up to some interesting puzzles. The Moondrop team consists of Kenneth, Andreas and Stig-Owe who I hope has entered the Norwegian gaming biz to stay, we need all the men/women we can get! I don't know what the Moondrop team is going to use their reward for, but whether they build further on Kesper's Keep, or start an entierly new project, atleast my country can add one more indieteam to it's roster. We're starting the year with KABOOMelz! Headbutt out of the old year, head-on into the new! We're starting this year by competing in the Norwegian Championship of Gameplay. We've been working like crazy all week, cuz one week is all we've got to finish one title! We're showing off the game the 8th of January. The goal is to create an exciting title to show off to an audience and a jury, competiting for the title of "Champion Gamedesigner". The game has to have a theme, and this year's theme is: "Light". I've already had a few titles in-cooporating light as a theme, but we've started an on an idea from scratch! We've got 5-10 min to impress the crowd and the jury, so we needed something that plays fast, frantic and crazy. Three days left before deadline, and we're definetly on track. We're going to post some screens and some gameplay footage once we've got some of quality. PS. The festive version of Dungeon Chaos has now been removed, but will be playable next holiday season. 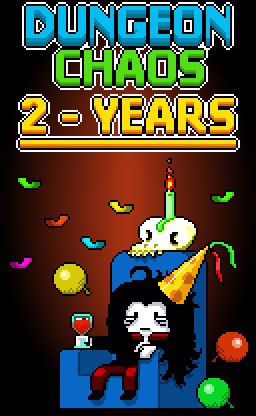 And here is a very special gift from Roflgames to you! Dungeon Chaos has recieved a very special update, an Xmas update to be exact, topped off with several new features, that will be in the final version next year! The shop has been re-enhanced, and added with lots of upgrades, foods(Xmassy ones) and quests(Not so Xmassy). I've redone some graphics, and Vinter has also helped me by adding some Xmas music. Be fast to download though, I'll only host this special game through the holiday season, until New Years Eve. Dungeon Chaos Xmas v1.0, Unavailable outside of holiday season. The original version of Dungeon Chaos can be found here. Christmas is anticipation! And Christmas is games! Are there thin, rectangle shaped presents under the Xmas-tree? Possible new Xbox/Ps/Pc discs for your game catalogue? If not, Christmas may become dull very fast. But fret not, there will be games, and either tomorrow, or on Christmas eve, there will be a present for you under the Rofl-tree. For a surprise Rofl Christmas title. Difficultest, yet coolest game ever? I've spent long frustrating hours trying to complete Super Meat Boy on my Xbox, sparks flying as I tried to defeat the last boss. My salvation was promising Simon some pizza and handing him the controller, thinking he couldn't possibly do it. After 3 hours of ruthless controller mashing, a big Mincemeat Pizza was his for the eating. What inspires me most about Meatboy is it's super fast gameplay, and the feel you get when doing an awesome dodge. It's also good for when you need to frustrate those around you. For a game with finger-lickingly good controls, it's still not an easy course to get through. It's the hardest meal I've ever had, one I didn't manage to finish myself at that-. Minecraft inspires me because of it's openess and it's effective use of graphics. I'm a huge fan of open game-worlds, and Minecraft is the prime example of such games. Others include Morrowind, Oblivion and Fallout, etc. and even these huge game-worlds, can't compare to the hugeness of Minecraft. If I'm ever going to do an entierly open game-world in one of my projects, I'd follow Minecraft's example. 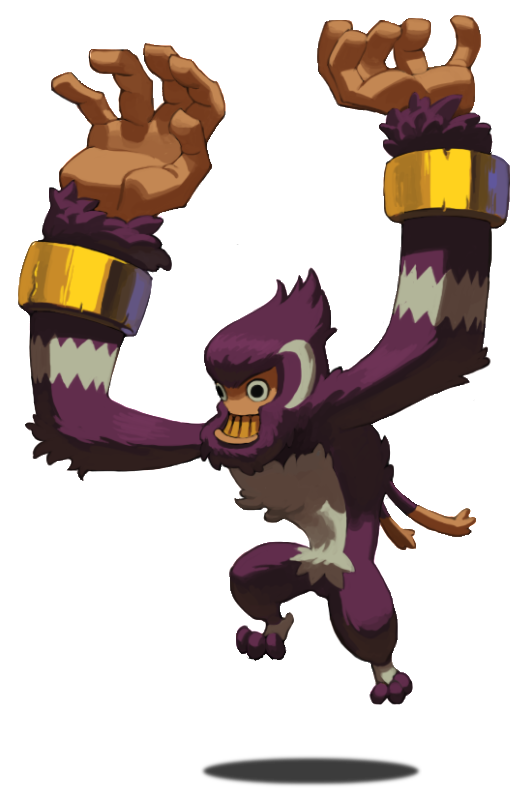 Simon has started animating a new enemy, and it's in need of a name, but for now, let's call him Lava Monkey! Aleksander Vinter has been acting like a source of inspiration for me, for the past few years, and listening to his music usually fuels my mind with visual images, like gameplay videos playing out inside my eyelids. Vinter is quite particular of which style the project is going to have, and we've spent quite some time figuring out the appearence of the character. Vinter has started creating some sprites of his own! It's going to be a fast paced action game, that is all I can say. I'll have more details on gameplay later, including a video trailer. It's gonna have classic ViH beats in it. Here is the recently released official music video for Ride Like The Wind, inspiered from the ViH universe. Me and Simon made an appearance as this-years winners at NGA last week, hoping to inspire upcoming game-designers to start creating games at their heart's content, be it small or huge! Our task was to talk about Owlboy and the team's future, and our payment was free beer in the bar! Hard work simply pays off! So, what is the team's future? A miserable pile of secrets! We've got so many secret projects on our minds, that we've decided to start giving away some of their premises. We'll soon announce a few projects we've been working on, so stay tuned for more meat on the massive bone of gaming! Fable 3 has been given another playthrough! Development on Owlboy is ahead of schedule! People are hankering for more Fableous! A well made week! Simon drew the D-Pad Team's Owlboy Avatars this week! And what a team we be! Fableous has caught the attention of many a Fable fan! As well as being featured on GameTrailers, - websites Kotaku, Joystiq and The Escapist(Home of my favorite game review series, Zero Punctuation) had articles on it. 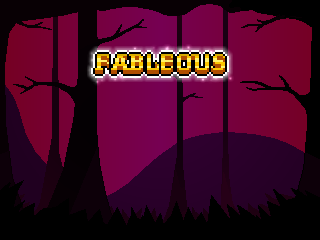 All links have been added to the new Fableous Game Page. A week after it's release, Fable 3 has been played, tested, completed and analysed to death by me and D-Pad's artist Simon. Playing games, to us, is research first, entertainment second. We've reached a clear conclusion: The Fable series has yet to realize it's potential. Yet, there are several great things in Fable 3, that I want to implement into the Fan Project and in the weeks to come, I'll discuss the features that I think made Fable 3 stand out from the rest of the series entrants, and how I'd like to improve on these. My Chicken posse of three stayed with me through the entire adventure(Caused by a bug that did not allow me to finish the Chicken quest). From the left is "Google", "Smoogle" and "Fry Stephens". Along my side, they witnessed the Royal Treasury dwindle, and Albion crumble. 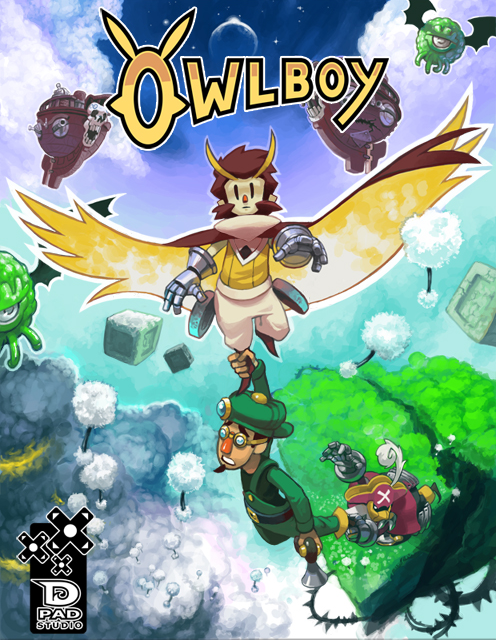 My team has got it's new site up and running over at www.DPadStudio.com, and on this site, the whole team will make updates every week, on Owlboy and the rest of our projects . We've got a Facebook page aswell, which updates on a very regular basis. Tomorrow is Fable 3's release date! Today is Fableous's! This is a very very short concept demo, and alot of features already implemented, has been cut from the demo in order to balance gameplay. This has resulted in spells being removed, stat progression and map locations. The demo will play out in a Hobbe Cave. What is in the demo then?? Weapons include Sword, Bow and Pistol for this demo, yet there are several other weapons already implemeneted which did not make it to the release. You'll have to find some secrets in order to steel yourself against the boss at the end. Equipment include a basic fishing rod, as well as a pickaxe. The demo contains a rougly built up inventory system. Think World Of Warcraft meets Minecraft. The player opens up the inventory by pressing 'I', where the player can use or locate equipment to the action buttons on display. To use and scroll through the actions, the player can use the mouse-wheel, or the digit-keys on the keyboard. To use the selected action, press left-mouse button. There is still alot of tweaking to be done to the system, but it felt complete enough for this demo. There is a moral choice at the end, and the plan is to let the player's choice affect the population of Albion's relationsship to the Hobbes. For explorers, don't watch the Playthrough, as it contains clues on what to do in the demo. The music in the demo is composed by Aleksander Vinter, and Hobbe grunting sounds are made by my team's artist, Simon. Is there more to come? By and by, Yes! This isn't even a proper concept demo, as it does not even begin to grasp around the concept of Fable. It's merely a project to occupy my mind, while waiting for the release of Fable 3. It's probably riddled with bugs aswell. The project had a nice start however, and I will definetly use what I have learned from working on it in the future. Body Morphing is still being worked on, the magic and leveling(progression) system is far from complete, and there's just an abundance of improvements to be made to the game, or, concept if you will. I'll use spare weekends to further develop the concept, but after Fable 3's release, the team's main priority is the new D-Pad Studio website and Owlboy. 5 Hours till my local game store opens, and I'll be ready with a mug of coffe by their doors. Happy Fabling - and Halloween aswell! Read further info on our projects, every Thursday, on DPadStudio.com, and Roflgames! 1 week left for Fable 3's release, and anticipation levels are in the red-zone at my house! Combat is one of the aspects of Fable I really was looking foreward to! Growing up with RPG's like Baulder's Gate and Might & Magic, I could barely wait to see what kind of tricks and powers were at my disposal when Fable got it's release. I wasn't too dissapointed, yet I never quite felt that Fable had a Level-Up system that complemented the use of magic in the game. One of the features I've tried to improve	this week is the 'Magic-System' from Fable 2. 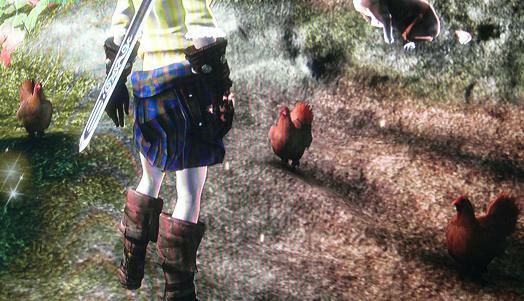 In Fable 2, action stopped, and your hero started taking blows from opponents when charging a magic spell. When action is fast and a player is in combat, usually, the last thing the player wants is to get slowed down or hit. Further improvements to the spell system will be made, by incorporating different spells, and stats for each spell. In classic RPG's, there is no limit to how powerful a hero can become. I'll bring Disgaea: Hour of Darkness in as an example. In Disgaea, the hero's level was limited to lvl 9999. An almost impossible number to reach if one is not a completionist. All spells and moves could be powered up individually, by simply using them. This is how I want to implement the spell system, and also let Hero Spell Power affect the outcome of a spell. Thursday next week will be special. In my country Fable 3 releases on Oct.29th, and my plan is to have a playable demo ready the day before this. If I do not reach this deadline, development will still continue, but at a slower pace, as my team is getting ready to release the new D-Pad Studio website. Come back next week, and you might get a chance at trying the fan project right before Fable 3's release. Fable 3's release is 2 weeks from now, which is also the demonstration-deadline for this project. Until deadline there are a few improvements to the franchise I want to bring into the spotlight, by implementing them into the project. One of those features is the 'Fishing-System' from Fable 1. Fishing in Fable was never quite intuitive enough in my opinion, as vigourous button mashing is not my preffered cup of tea. Further improvements to the fishing system will be made, by incorporating different lures, and letting the Hero Strength stat affect throw distance, and reel speed. The line will also snap on pressure, and will be indicated by the fishing-line's color, going from white to red. Improving the economy from Fable 2 will also be a focusing point of mine on this project. Where in Fable 2, there was huge issue with the balancing of economics in-game, in the fan-project, I intend to break this by keeping the players ability to buy stalls, but requiring them to stock-pile the stalls themselves, giving meaning to the fishing system. I've figured out systems for stockpiling the rest of the Fable 2 stalls aswell, but I'll keep these under wraps for another update. Follow the progress of the fan-game Thursday next week, as I'm adding more features continously. The concept behind Fable has inspiered alot of ideas for my part, and the Role Playing aspect of it is solid: "Be who the heck you want to be, but take the damn consequences." What I've seen the games do, compared to what has been promised(in the past), has always left a wealthy amount of players dissapointed. I've taken the oppertunity to start a small tribute project, which is aimed to be released before the launch of Fable (Lucky-Number) 3. The plan is to bring some missed features(Real-time Vegetation Growth, Weapon Pickups), aswell as features from the previous games(Body morphing, Moral choices, Crumbtrail), into a simplistic 2D retro-styled game. This is a tribute game, and may not capture Fable's magic, but it'll try to capture some of it's basic concepts. Later this week or the next, I'm going to show more of the project, and perhaps provide a small playable demo. YES! One month from now, Fable 3 will be hitting the stores! I've experience Fable to be a so-so game, but the ideas behind it's concept are so fantastic, that I hope for some of these ideas to be realised with the new installment. I've personally tried to re-create some of the basic ideas of Fable in my own games, which is still hidden on my computer. Up until the release of Fable, I'll post screens and concepts from these projects, and on the final day, I might release a small tribute demo. A trailer made by one of my own countrymen has also spread across the net, and I'll help along by spreading it's message: Those who haven't yet tried Minecraft, try it! You'll understand once your in.